Major players in the market are focused towards enhancing their presence and expanding their customer base through strategic mergers and acquisitions. The major players in the pest control service market are moving forward to develop new technologies and products for the benefit of the customers. Demand for pest control services such as heat treatment and exterminator services, especially for bedbug and ant control, is increasing in the U.S. This is mainly attributed to growing population of bedbugs and other pests such as ants, due to conducive weather conditions for their propagation in the region. Pest control service providers are concentrating on replacing toxic pesticides with bio-based pesticides or herbicides to offer eco-friendly pest control services in order to ensure adherence to stringent government regulations. Besides, end users such as hotels and mining industry in the commercial and industrial sectors are increasingly inclined towards pest control services, especially for rats & rodents prevention. Regions such as Germany and Scotland are major regions in the Western Europe for brewing industry and very attractive place for pests and insects. The by-products of brewing such as dried yeast are liable for severe infestation for spider, beetles and cockroaches. These pests spread infections by laying eggs and also dangerous for barley and malt. Thus pest control services have become mandatory in brewing industries and would also witness a growth in future as demand for high quality alcohol is gradually rising among the consumers. The segment is estimated to be valued more than US$ 11 Bn by 2017 end, and is expected to increase at a CAGR of 5.0% over the forecast period. The segment is expected to be valued little more than US$ 18 Bn by the end of 2027, creating absolute $ opportunity of more than US$ 550 Mn in 2017 over 2016 and an incremental $ opportunity of more than US$ 7,300 Mn between 2017 and 2027. Insect control segment is estimated to account for relatively high value share of more than 65% by 2017 end. In insects control segment, ant control segment is expected to create significant incremental opportunity in the market over the forecast period. The global pest control services market is anticipated to exhibit significant growth rate over the forecast period. Revenue from the global pest control services market was valued at more than US$ 16 Bn in 2016. By 2027 end, global pest control services market is expected to reach a value of more than US$ 28 Bn expanding at a CAGR of 5.1% over the forecast period. Future Market Insights in its newly published report, “Pest Control Services Market: Global Industry Analysis (2012-2016) and Opportunity Assessment (2017–2027),” provides forecast and analysis of the market on the global and regional levels. Through an extensive research, our analysts have studied how the different market dynamics are likely to impact the current and future scenario of the global pest control services market, thereby providing useful insights to market players to plan their differentiating strategies, capable of evolving with the changing market landscape. We have analysed the key trends, drivers, restraints and opportunities while studying this report. Impact analysis of key growth drivers and restraints based on the weighted average model are included in the report to better equip and arm clients with crystal-clear and decision-making insights. 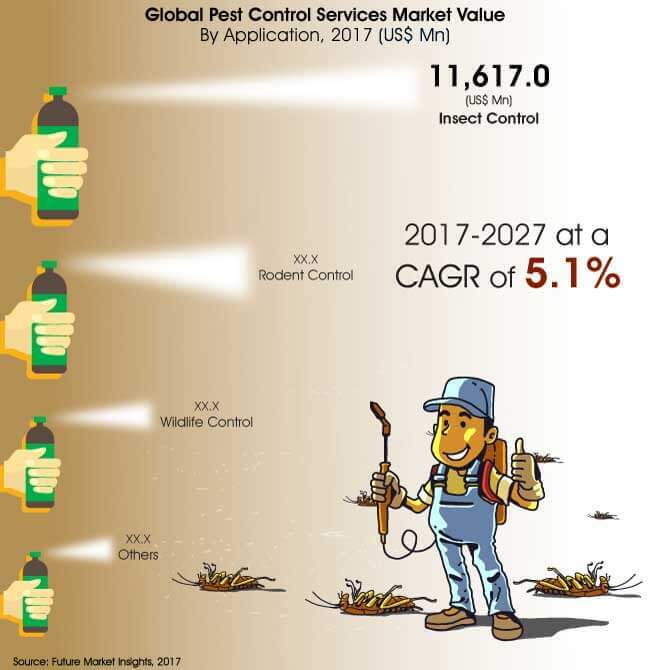 To understand and assess market opportunities and trends, the global pest control services market report is categorically split into different sections based on service types, application end-use industries, and regions. The report starts with the market overview and provides market definition and taxonomy along with value chain, region wise pricing analysis, drivers, restraints, and trends in the market. All the above mentioned segments evaluate the market on the basis of various factors affecting the market. Each section discusses the qualitative and quantitative aspects of the global pest control services market. To give a brief idea about revenue opportunities from the type, end-use industry and region/country-wise segments, the report also provides volume (metric tons) data, absolute $ opportunity, and total incremental opportunity for each segment over the forecast period (2017-2027). In the final section of the report, we have provided a detailed competition landscape with company market share and performance, in order to provide report audiences with a dashboard view of key players operating in the global pest control services market along with their business strategies. This would enable clients to assess strategies deployed by market leaders and help them develop effective strategies accordingly. For market data analysis, the analysts have considered 2016 as the base year, with market numbers are estimated for 2017 and forecast made for 2017–2027. To calculate the market size, the report has considered the weighted average price of pest control services, based on service type of pest control such as chemical and mechanical pest control service across key geographies on a regional basis. The forecast assesses the total revenue (US$ Mn) as well as volume (Metric Tons) of the global pest control services market. To deduce market volume size, consumption of pest control services has been considered. In order to provide an accurate forecast, the analysts have sized up the current market, which forms the basis of how the global pest control services market is likely to develop in the future. The critical market data, including the base number and segment splits, has devised through in-depth secondary research. This data is then triangulated on the basis of different verticals, considering both supply side and demand side drivers and other dynamics of the various regional markets, along with primary interviews of manufacturers and industry experts operating in the global pest control services market. The forecast presented in the report evaluates the actual consumption of pest control services and expected consumption in the global pest control services market over the forecast period. 16.5.3.Pepcopp Pest Control Services Pvt Ltd.
16.5.5. Pest Control (India) pvt. Ltd.